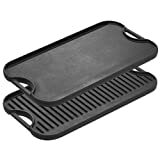 Expand your cooking options on the grill, on the stove or in the oven with this cool new La Plancha Cast-Iron Griddle. 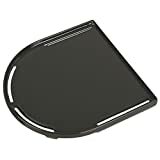 This heavy-duty cast iron griddle has a high back that helps to keep food from falling over the edge, heats evenly and retains the temperature. 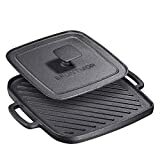 It's perfect for cooking vegetables, fajitas, grilled sandwiches, hash browns, burgers, steaks or anything you want indoors or out with ease. Lodge LPGI3 Pro-Grid Cast Iron Reversible 20" x 10"